They arrived in Seattle lovingly packed and frozen, straight from the Santa Fe farmers market. Someone who loves me seeded the roasted chiles and pulled them apart into strips, a painstaking labor. I had to do right by them. There’s this little taqueria in Santa Barbara called La Super-Rica that became famous as Julia Child’s favorite taco joint. There is always a line down the block. There are a lot of great tacos in that part of the world, and some of my personal favorites actually come from Reyes Market in Carpenteria, but La Super-Rica makes one dish that I love. Love. They call it “rajas,” a name referring to the roasted strips of poblano pepper, but those peppers are also smothered in salty cheese. You scoop them up with a warm tortilla and let the grease run down your arms. Luckily Seattle is not very close to Santa Barbara, so this is an occasional indulgence. I’m calling my version “Queso Fundido,” which is a Mexican dish of melted cheese enhanced with bits of meat or vegetables or spicy peppers, meant to be scooped up with chips or wrapped in corn tortillas. As I like to do, however, I’ve inverted the traditional proportions, starting with a pan chock-full of vegetables and stirring in just enough cheese to make the dish come together. And we loved it. 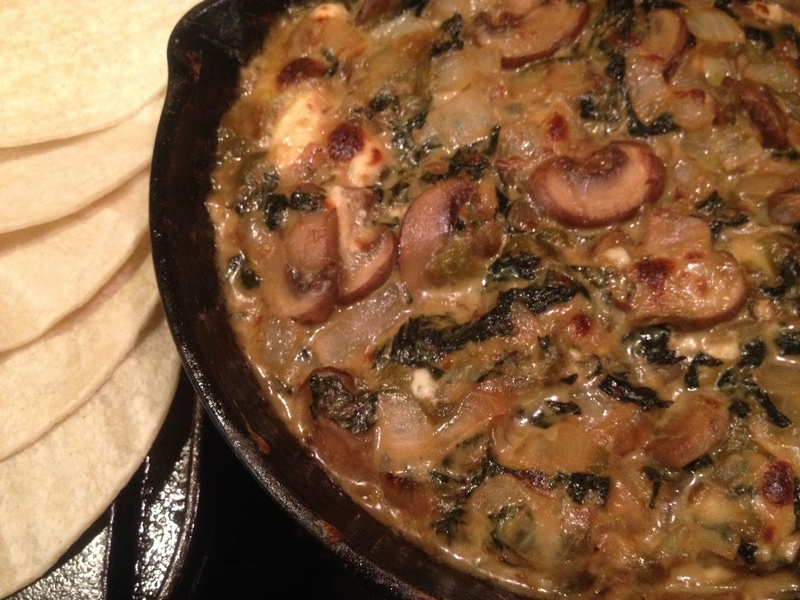 Queso Fundido with Mushrooms, Greens, and Chiles: Saute an onion and 8 oz. sliced mushrooms over high heat until everything is well browned and the liquid has evaporated. Season with salt and add a few big handfuls of thinly-sliced ribbons of greens (I used lacinato kale, but chard or even beet greens would be good as well) and a big handful of strips of roasted chiles. * Add another pinch of salt, stir to wilt and evaporate the moisture, then deglaze the pan with a splash of your beer. Reduce heat to low, crumble in a chunk of feta (it’s really just for the salty tang and you don’t want an assertively sheepy flavor here, so save the fancy stuff) and about a cup of mozzarella or jack cheese. Stir until the cheese is melted and then place under the broiler for one or two minutes to brown the top. Serve with warm corn tortillas and a big green salad. *If you are lucky and have roasted New Mexican chiles, use them. If you are industrious, you can roast, peel, and seed a couple of poblanos and they will be great here. If you are using canned green chiles, drain them first. In any case, taste the peppers and determine the quantity to use based on your spice tolerance. This entry was posted in Mexican Flavors, My Favorite Recipes, Snacks and Apps and tagged cheese, cooking, dinner, DIY, family, food, homemade, kale, lifestyle, recipes, vegetarian on April 11, 2012 by emmycooks. Rajas poblanas! Those are one of my absolute favorite things to order at my (also) favorite Mexican restaurant ever. I must try this as soon as decent peppers are back in the farmer’s market. So good! We have a serious lack of good Mexican food in Seattle so I have to muddle through on my own. I will definitely be making this again. mmm, got to try this. I love Mexican food! Me too, Mexican food is my favorite. So hopefully you’re not getting tired of it around here! Looks delicious–and I always preferred La Super Cuca to La Super Rica, and now we’ve found El Rincon which makes the most amazing al Pastor tacos ever…but your recipe looks to die for. Is that the place on State St.? We will have to put it on our list to check out next time! I am absolutely salivating. Chilies? Cheese? Hot? Yes, please! And you can make it on your stovetop. Sorry to hear about your oven!! Oh, thanks for reminding me of La Super-Rica. Such a great place, and I haven’t thought of it in years (well, also, I haven’t been to Santa Barbara in years!). This looks so good. Thank you! And yum. We ate so well in New Mexico! Only one word comes to mind- Wow! Looks amazing!